I love Arctic Char! It is slightly milder in taste than wild salmon and is reminiscent of trout. It is just delightful! Nutritionally, it is superb: it’s a great source of protein and is rich in omega-3 healthy fatty acids. It is also a sustainable fish and is therefore a responsible choice for our planet! This is such a simple recipe that involves broiling the fish with a little drizzle of fresh lemon juice and olive oil, that’s it! The sliced grilled pear (see recipe here) is a nice addition to make this a perfect elegant dish over mixed greens and walnuts. What a perfect summer dish all in one plate…and you know how much I love that! Place the arctic char filet, skin side down in a baking pan and sprinkle with coarse salt. Mix the lemon juice and olive oil and drizzle over the fish. Grind fresh pepper (generously) over the fish and bake on upper rack for about 10-12 minutes. Slice into 4 equal portions (you can serve it hot or cold) and place sliced pears on top of each slice when ready to serve. Barbara, not right up to the broiler but one level down. Does that make sense? Barbara, not right up to the broiler but one down. Does that make sense? 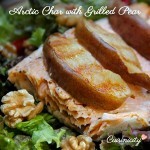 I made your Arctic Char with Grilled Pear recipe for my husband and me, and we both LOVED it!! 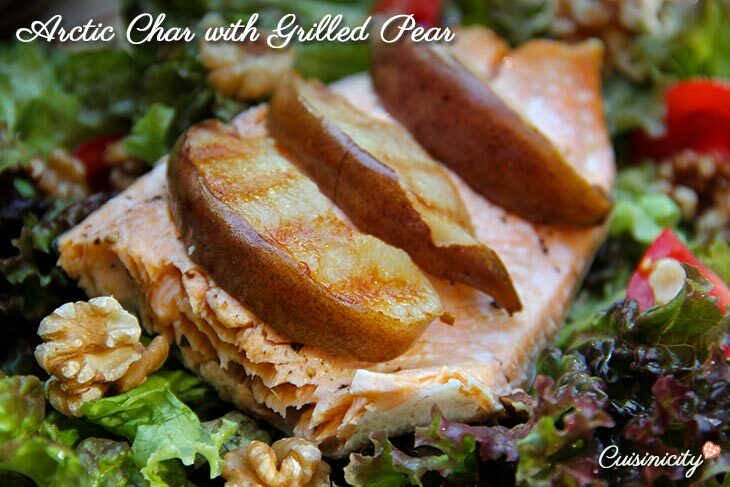 Initially my husband said he didn’t want any of the grilled pears, but after eating it with the Arctic Char, he remarked that it was the pears that made the dish!! Thanks for another wonderful recipe!! I am so happy to hear that! I posted this recipe in response to your question about how to best combine my grilled pears with fish so you are the inspiration behind it and the credit is all yours! I love that your husband loved it too!